Canada has a founding people who once traversed North America’s interior in Red River Carts hunted Bison with military precision, danced and jigged to spirited fiddle rhythms, wore brightly adorned embroidered clothing as well as sashes or shawls, spoke their own unique language. These people were the méstis, as the word was known at the time of contact, means mixed in French. From méstis evolved méchif and mitchif or Michif, the name of a language, a culture and a people within the nation. The epistemological roots of the word are very important because the word presently denotes a distinct Indigenous nation with a talent for adopting other cultural traditions and making them their own. Indeed, they have always practiced a culture which has fused First Nations (Cree, Saulteaux, Dene and Dakota), Euro-Canadian (Canadien), and European (Scots/Orkney) parent cultures into a unique synthesis. Starting at the North end of the Okanagan in Vernon and ending at the South end of the Okanagan in Okanagan Falls August 31, 2012. 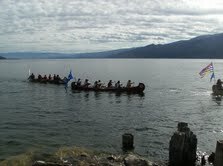 Sixteen canoes each with 6 to 10 paddlers from all over Canada and the United States. More pictures are under CULTURE and then click on Photos. Photos are of the reception at Peachland and more will follow this weekend taken at Okanagan Falls where a Salmon Feast will be at 6:00 pm.